"This soup is served with a plate full of fresh garnishes as well as various sauces. This allows each person to season their serving to taste. The soup is somewhat unusual, because the meat is cooked in the bowl. The beef is sliced very thin, almost thin enough to see through. You might want to have the butcher slice it for you. The boiling hot broth is poured over the noodles and raw meat. 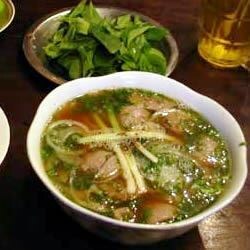 The meat is quickly cooked in the hot broth in the time it takes to garnish the soup." In a large soup pot, combine broth, onion, ginger, lemon grass, cinnamon, and peppercorns. Bring to a boil, reduce heat, and cover. Simmer for 1 hour. Arrange bean sprouts, mint, basil, and cilantro on a platter with chilies and lime. Soak the noodles in hot water to cover for 15 minutes or until soft. Drain. Place equal portions of noodles into 6 large soup bowls, and place raw beef on top. Ladle hot broth over noodles and beef. Pass platter with garnishes and sauces. Missing important star anise. Soup can't exist without it. So so so so good. As other reviewers have mentioned....definitely freeze the beef before slicing (the thinner, the better) & add some star anise and cloves. Quick and delicious!